When they invaded the Soviet Union in June 1941, the Germans were confident of a swift victory over the Russian untermenschen (subhumans). But as Napoleon before them had discovered, the vastness of Russia and the fighting skills of her people, especially under able leadership, are formidable challenges. In 1941, the original thrust of the Nazis was repelled before Moscow. In 1942 they were defeated at Stalingrad, and in the summer of 1943 there was the Battle of Kursk, an even more decisive setback for Hitler than his disaster on the Volga. This latter engagement has been termed history’s greatest tank battle. Its dimensions stagger the imagination, and the tactics employed challenge the military mind. It has always been a temptation to designate Stalingrad as the turning point of World War II. But although this battle demonstrated a remarkable improvement in the operational skills of Soviet soldiers and weapons, it was only a part of a widespread campaign. At the same time, it must be realized that the German Army, though reduced in its military capabilities after its defeat on the Volga, was still a formidable force. This was demonstrated in mid-March 1943 when the Nazis recaptured the vital city of Kharkov. 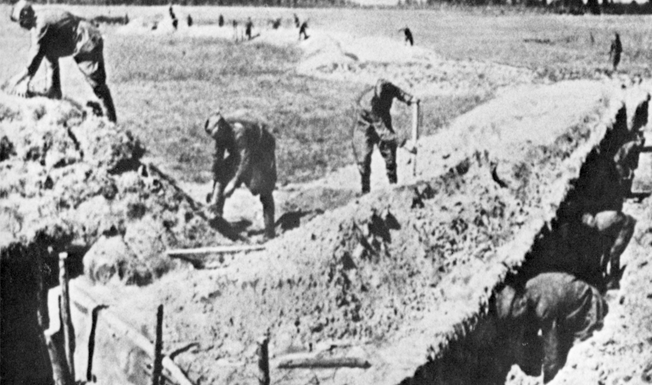 As the front stabilized during spring 1943, the Soviet General Staff tried to determine the Germans’ next move. The consensus was that the Kursk salient was the only place where the enemy was in position to launch an attack with any prospect of success. The concentration of panzer forces and infantry divisions around Orel and Kharkov hinted that these were the staging areas for the coming attack. The Soviets presumed that two heavy armored incursions north and south of the neck of the salient would attempt to converge and encircle the Soviet forces. Having surmised the Nazis’ intentions, the next step for the Russians was to decide how to respond. Josef Stalin instinctively sought an offensive solution: an attack launched preemptively against German positions, followed by hot pursuit. Zhukov and the General Staff rejected this, and on April 8 the former suggested a plan that was adopted as Soviet strategy for 1943: Soviet forces would meet the German offensive against Kursk with deep defensive lines aimed at debilitating the enemy’s panzer forces, and then respond with a strong counteroffensive intended to thoroughly defeat the enemy. The Russians looked upon the Kursk salient as their springboard for the reconquest of Orel and Briansk to the northwest and the Ukraine to the southwest. Accordingly, there were enormous Russian troop concentrations. Ever since March they had been fortifying the salient with thousands of miles of trenches, thousands of gun emplacements, and defenses along its north, west, and south sides stretching as deeply as 65 miles. Zhukov, who remained the chief architect of the campaign, was born in 1896, the son of a village cobbler. He was conscripted into the Imperial Russian cavalry in 1915 and joined the Red Army when it was created in 1918. During the 1920s and 1930s he pursued a conventional military career, rising in prominence as a combat commander. He had previously been instrumental in the planning of the Soviet victories before Moscow in 1941 and at Stalingrad in 1942. By March 1943 Hitler was determined, for both political and economic reasons, to hold a front running from the Gulf of Finland down to the Sea of Azov, and to inflict a resounding defeat on the Russians at Kursk, thereby trapping vast numbers of the enemy and changing the strategic situation in the Germans’ favor. A victory here might even facilitate a new offensive against Moscow. He felt that the operation would succeed, provided it was undertaken soon. Indeed, on the northern shoulder of the region, General Walter Model’s Ninth Army was poised to strike, but its operations were delayed due to the unfavorable condition of the terrain and the slowness with which the German divisions were being replenished. In these circumstances General Model felt that the operation could not succeed without strong reinforcements by heavy modern tanks, superior to anything the Russians possessed. Based on Model’s reservations, the attack was postponed until the middle of June, while a large number of new Tiger and Panther tanks and Ferdinand mobile guns were rushed from armament works in Germany straight to the front. Model had been commissioned into the German infantry in 1910, and served on the General Staff toward the end of World War I. An ardent Nazi, he served in Poland in 1939 and France in 1940 before taking over command of a panzer corps in Russia. The main assault was delivered on the southern shoulder of the salient by von Manstein’s Army Group South. During World War I, von Manstein had fought at Verdun and the Somme. An experienced officer, he served in Poland and the West during 1939 and 1940. He had then enjoyed outstanding success on the Eastern Front and was promoted to field marshal in 1942. His forces were instrumental in the recapture of Kharkov after the fall of Stalingrad. Colonel General Hermann Hoth’s Fourth Panzer Army in Army Group South consisted not only of the heavily equipped II SS Corps of three divisions, but also the XXXXVIII Panzer Corps, both of which were considerable threats to the Russians. But there were further delays by the Germans, caused by, among other things, Hitler’s fear that Italy was on the point of dropping out of the war. When he finally was satisfied that Mussolini was not giving up, he decided to proceed with his original plan regarding Kursk. A victory here, he declared, would fire the imagination of the world. As spring gave way to summer, all the Nazi units had ample opportunity to make up their equipment shortages and organize effectively. Meanwhile, the Russians under Zhukov and Marshal Aleksandr M. Vasilevsky had not squandered their time. Nothing suited them better than having the Germans attack them at Kursk, where they were strongest. Soviet air and ground reconnaissance observed every detail of the German preparations. 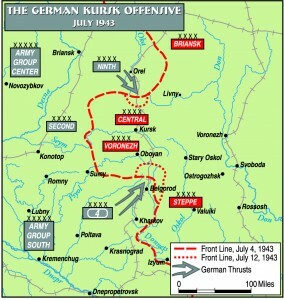 On the northern half of the Kursk bulge, Army General Konstantin K. Rokossovsky’s Central Front—consisting of Lt. Gen. A.G. Rodin’s 2nd Tank Army, Lt. Gen. N.P. Pukhov’s 13th Army, and Lt. Gen. I.V. Galanin’s 70th Army—was set to meet the main thrust of Model’s Ninth Army. In the south, the young Army General Nickolay F. Vatutin, with Nikita S. Khrushchev as his political commissar, commanded the Voronezh Front waiting for the main German assault. However, the Russians did not rely upon this force alone to thwart a breakthrough. It was backed up by Marshal Ivan S. Konev’s Steppe Front, which numbered 449,133 men. Konev was an experienced officer who had been conscripted into the Imperial Army in 1916 and after the Russian Revolution became a political commissar. He rose to a position of power as a colleague and sometime rival of Marshal Zhukov. With these three segments, Soviet superiority in the Kursk region was 3:1 in manpower and 1.5:1 in armor. While outnumbered, the German force was still powerful. It had 2,000 tanks in the vicinity of the salient, more than half of them in the southern sector commanded by General Hoth, and nearly 2,000 planes. With such heavy German concentrations, Hitler looked forward to the battle with great confidence. He was sure that the northern and southern striking forces would break through and close the ring east of Kursk. After the delays imposed by armament and politics, the German attack—called Operation Citadel—was scheduled for the morning of July 5, 1943. 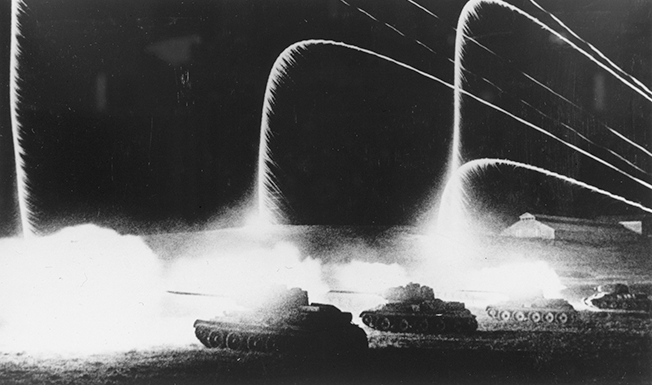 Through defectors and reconnaissance reports, the Soviet commanders were able to predict this attack to the minute. In fact, a half-hour before the German artillery was scheduled to begin firing, the Russians launched their own barrage against every area where the attackers were likely to assemble. Contrary to Nazi expectations, their forces met with devastating resistance, even though their troops exerted themselves to the utmost. Their attacks continued to penetrate into the deep Russian defenses, but they suffered severe losses, and on July 7 the Russians threw in increasingly heavy tank forces. Even so, Hitler ordered the offensive to continue. On July 10, the Western Allies landed in Sicily, and he needed his “Kursk victory” more than ever. 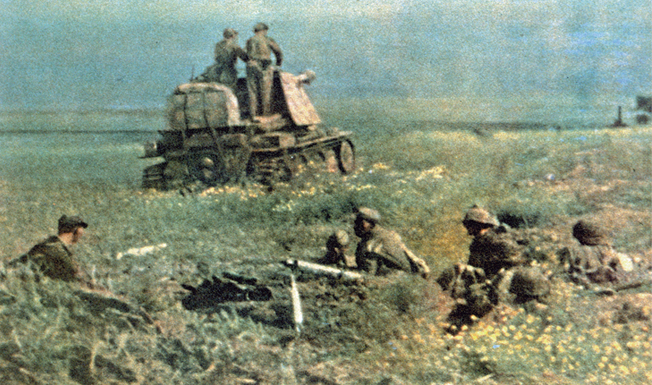 In reality, after the Nazis’ initial tactical successes, the Battle of Kursk had come to a standstill. It reached its critical point on July 11 and 12, when Hoth, in charge of the southern German thrust, turned his panzer spearhead northeast to envelop the Soviet 1st Tank Army. After initial German success, the Russians counterattacked. Over 1,200 tanks on both sides were engaged in this struggle. The battlefield in the Prokhorovka area was compressed into a space of roughly three square miles. From the moment the leading elements of Soviet armor crashed through the Germans’ first echelon, the commanders on both sides lost all control of their formations, and the battle became a confused free-for-all in which every tank fought individually amid a packed mass of armor. At practically point-blank range, the Tigers lost the advantages of armor and armament they enjoyed over the Soviet T-34s at longer range. By the end of July 12, the area was a graveyard of burned-out Soviet and German tanks. While Hoth hoped to continue the attack east of Belgorod, Hitler at this time ordered von Manstein to begin withdrawing the II SS Panzer Corps from battle so that it could be moved west to deal with the deteriorating situation in Sicily. Von Manstein complied, and all German hopes for a renewed offensive, however unrealistic they may have been, evaporated. To this time, the Germans had no more than dented the Kursk salient by some 10 miles along a front of about 12 miles in the north, and by some 30 miles along a 30-mile front in the south. Approximately a hundred miles still separated the two German forces when the battle came to a standstill. Nearly the entire German panzer force had been destroyed. Thus the initiative fell to the Red Army. Despite heavy losses, the Russian command was able to launch its summer offensive along a very broad front with superior forces. Von Manstein concluded: “And so the last German offensive in the east ended in a fiasco, even though the enemy opposite the two attacking armies of Southern Army Group had suffered four times their losses in prisoners, dead and wounded.” This remained his assessment of the relative losses involved. On July 12, the Russian offensive against the northern flank and the Orel salient began. It penetrated 30 miles in three days, while a second advance, which was more direct, drove to within 15 miles of the city. However, four of the panzer divisions that Field Marshal Kluge had disengaged came up just in time to stop the Russians’ northern wing from establishing itself astride the railway from Orel to Briansk. Then the Russian offensive slowed, although superior numbers still forced the Germans back. It was a costly effort, but was helped by Rokossovsky’s forces changing over to the offensive on the southern flank of the Kursk salient. The Germans were finally squeezed out of Orel on August 5. 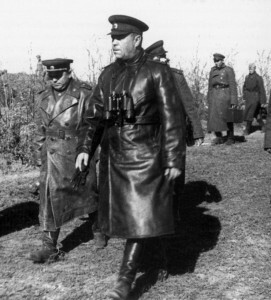 Marshal Zhukov wrote: “The counter-offensive in the Kursk Sector had been planned well before the enemy attack. According to the plan endorsed by GHQ in May, we contemplated a counter-offensive in the Orel direction coded ‘Kutuzov.’ Its objective was to strike at the enemy’s Orel [position], grouping three converging blows using the forces of the Central and Bryansk Fronts and the left flank of the Western Front.” Orel had not only been one of the most formidable bastions of the German front since 1941, but while in Nazi hands, it was a threat to Moscow. 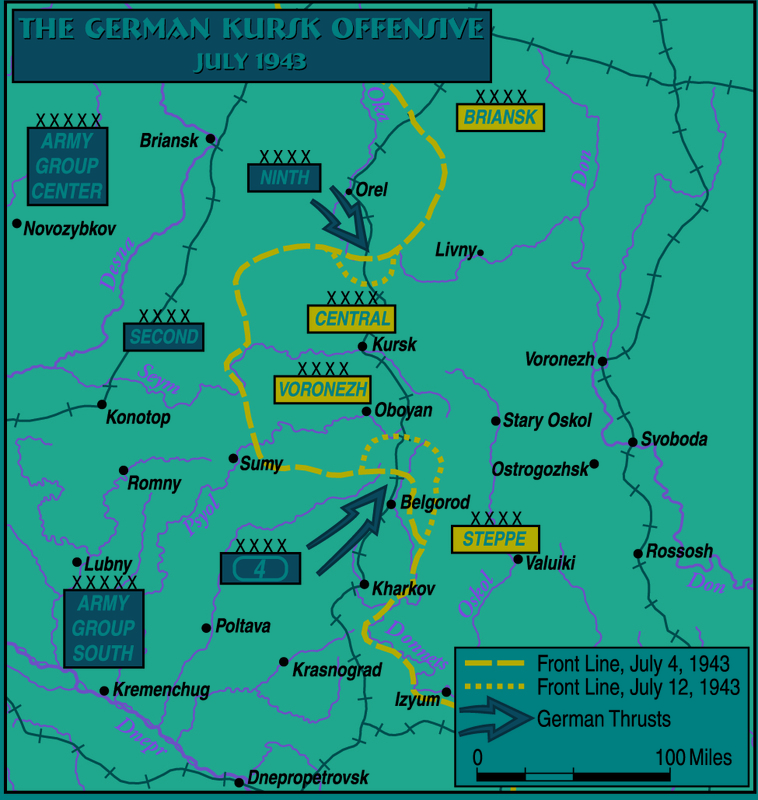 Meanwhile, General Nickolay Vatutin’s troops had followed up the Germans’ withdrawal from the breach on the southern side of the Kursk salient to the original line. On August 4, Vatutin launched an attack and captured Belgorod the next day. Exploiting the enemy’s exhaustion, he drove an additional eight miles the next week, wheeling toward the rear of Kharkov. This maneuver opened up the prospect of dislocating the Germans’ entire southern front.